360 degree cameras are not a new technology. However, the technology that actually makes the panoramic video look good is. The ability to truly utilize omnidirectional 360 degree HD surveillance video wasn’t truly invented until 2013 and hasn’t been available to purchase until recently. It’s pretty obvious how useful the tech could be for home security surveillance. Have you ever played one of those games where you have to avoid the camera that rotates back and forth? Well, with a 360 degree surveillance camera there’s nothing that you can avoid. That’s bad news for any would-be home invaders. Usually with newer technology cost a little extra, but in this case because you have to buy less cameras to get the same coverage, you would actually probably end up saving money. There are a few key factors you have to consider when you’re shopping for a 360 camera. They do have multi-lensed 360 cameras, but these are generally too expensive for normal consumers. That’s why the newer single lensed panoramic cameras are growing in popularity. The main factor that makes these cameras even possible is high resolution video recording. If you tried to stretch 360 degrees of video footage over only one megapixel for example, you would get barley any detail. It wouldn’t make a very useful security camera if you couldn’t even tell what was going on in the footage. But now they have cameras recording at higher than 20 megapixels, which is more than enough resolution to capture everything you need to. Essentially you can use a computer algorithm to flatten out the warped 360 footage and zoom into the part of the camera you need to see. Have you ever tried to zoom way in on a picture to see what was going on off in the distance? That’s basically the same thing, but at a way higher resolution. Because these cameras only use one lens or sensor, the video quality is usually more consistent. Other cameras typically have to focus on specific objects and adjust to the lighting. These adjustments can cause the camera to lose detail in some situations. This also means that the 360 degree cameras have less moving parts the other cameras. That makes them extremely reliable, which is good when you are using them for home security. Then of course you have your ultra-wide coverage and your lower overall cost. Typically, panoramic cameras will also come with your normal security camera features such as night vision, motion detection, and two way communications, but it’s probably a good idea to look out for these features. It wouldn’t be a very good security camera if you couldn’t capture someone skulking around in the dark after all. On top of all those features to look out for, it’s also important that the camera actually works well. 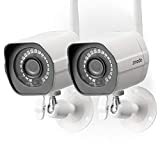 So after putting some of these cameras to the test, here is a list of quality panoramic security cameras you can use for your home. You may have heard of the “Godzilla 360 camera” and to be sure, it is a pretty good security camera. It has a sleek compact design and both an outdoor and indoor design. What we love about this camera is its simplicity in setting up. You basically just stick it on a coffee table and let it do its job. Some drawback though, it’s not very smart app friendly. We we’re very impressed with their mobile app either. It tends to be a little buggy and not everything works properly. There’s no doubt about it, Vivotek makes quality security cameras. These panoramic cameras are packed with a whopping 12-megapixel CMOS sensor. It also has IR sensors for day and night recording and does a really good job at reducing noise in very low light conditions. The only thing we don’t like about this camera is its lack of motion detection. Without motion detection you would need some pretty serious storage space to keep this camera running all of the time. Consider getting professionally monitored security cameras. Let’s face it; you’re not going to be available to watch your cameras all the time. So what happens if you miss that one time something bad happens? Get a free quote with Protect America now and don’t forget to ask about our latest deals!